These instances shocked and worried both the artists and the fans watching them. Being an idol means having extremely busy schedules, and that usually results in few sleeping hours and lack of rest. Here are instances during which idols collapsed on stage due to fatigue and shock. Who could forget the scary incident in 2010 where Krystal fainted on stage during f(x)’s “Mr. Boogie” performance. Fatigue and sleeping only a couple of hours a day became too much for her to handle. Krystal also fainted on Kim Yuna’s Kiss & Cry. After her performance, she collapsed to the ice with her head drooping. She struggled to hold herself up but was losing consciousness. The audience and fans were shocked and worried about her health condition. Singer Kim Jang Hoon collapsed while performing as part of the West Coast Festival Concert. In this Girl’s Day performance of “Something”, something didn’t look right with Hyeri. Hyeri eventually collapsed on stage right after the performance. When she couldn’t stand up alone, the Girl’s Day manager carried off the stage. She was immediately rushed to the hospital for treatment and later diagnosed with a cold and fatigue. Subin had an extremely busy schedule prior to her performance, and her body was not in good condition. After passing out she quickly received treatment and fans applauded her strength to continue with her schedules. Seung Ho attempted an acrobatic move, only to faint midway through the stunt and land on his neck. He remains motionless on the floor and it becomes apparent to everyone that he’s out cold. In 2009 after SHINee’s performance on KBS’s Music Bank, the group proceeded to leave the stage when suddenly the support structure for the lighting began to collapse. 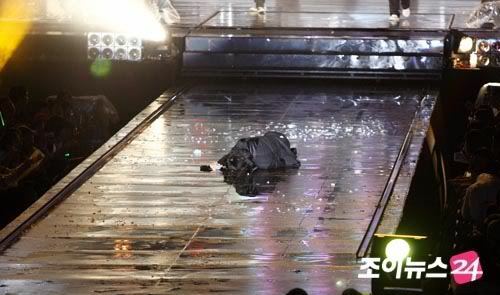 One of the light fixtures smashed to the floor, nearly hitting Onew, and Onew lost consciousness from shock and terror. While Super Junior members rushed to prevent the structure from collapsing on top of Onew, SHINee’s manager rushed to pick Onew up and carry him to safety. During their Japan concert tour, Goo Hara fainted immediately after her performance. After collapsing to the floor she was treated backstage, and later returned to the stage. Overworking finally proved to be too much for Hyuna on May 6, 2013, when she suffered from dehydration and high fever which caused her to faint in the midst of her busy schedules. N fainted during VIXX’s performance of “Love Me Do” in Gyeongju. He later reassured his fans through a post on his SNS that he would do his best to take better care of his health and show them greater performances. Joy, who was already exhausted from a busy schedule, nearly fainted when the stage effects startled her. However, she managed to get up and continue the performance like the pro she is. Seolhyun collapsed on stage while dancing to Wonder Girls’s “Tell Me” during the rehearsal of the 2016 DMC Festival. Yuju lost consciousness during a fansign meeting causing her fans to worry about her health and busy schedule. SinB also fainted during GFRIEND’s performance of “Mermaid”. From the middle of the performance, her face starts getting pale and eventually she falls to the ground, worrying her other members on stage.